I went down with my friend Vikki who conveniently has a family beach house in Dromana. 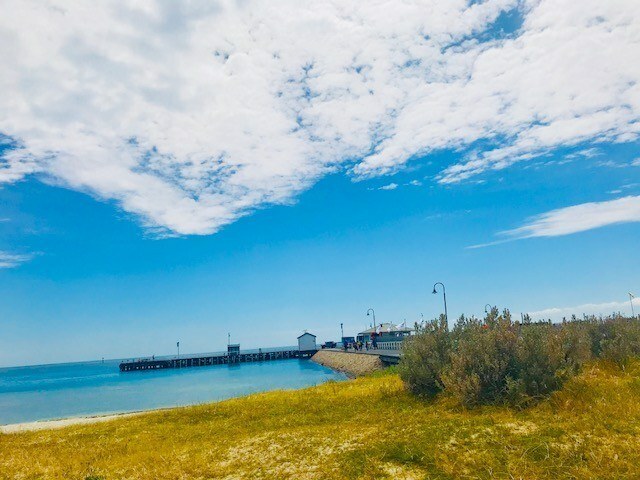 Dromana has changed a lot since my youth – it now has cute shops, some of the best Mornington Peninsula restaurants and is a bit of a happening area! This was also the weekend of the pumpkin for me. I am a bit obsessed with pumpkin. Proper pumpkin which I define as a pumpkin with dark skin. The light-skinned Halloween type tastes like the plainest butternut squash when cooked up. However dark skinned pumpkin is a whole other story! Roasted till it borders on mash this is one of my favourite things. It is very difficult to get in the UK so I was determined to eat as much pumpkin as possible. I am delighted to say that I managed to have pumpkin at all three meals over the weekend! It would have been a better story to have these in three meals that followed one another but alas I wasn’t quite able to manage that feat! Looking for other getaways from Melbourne? 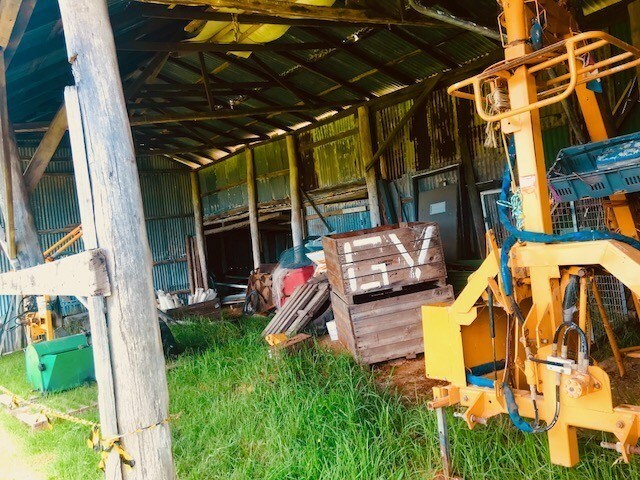 The Melbourne to Sydney drive is filled with interesting stops and things to do – check out this post which covers all you need to know! We drove down on a Friday afternoon and got to Dromana for wine time! We enjoyed our wine at a great restaurant called the Two Buoys which is on the main street along the front beach. It was packed for a winter’s Friday night. It did deserve to be packed but it was possibly helped by the fact that very little else was open! This is definitely one of the best Mornington Peninsula restaurants. They have a bar area which also has larger tables for eating as well as a separate restaurant. After a 30 minute wait (worth making a booking even in winter) we nabbed a table in the bar area. The menu is set up for sharing – one of my favourite things to do as I then get to try more items! We kicked off with the chicken wings. Friday night is chicken wings special and a ½ pound is only $5. This works out to approx. 7 wings so are great value. You are also offered your choice in terms of basting and we went with honey and soy. 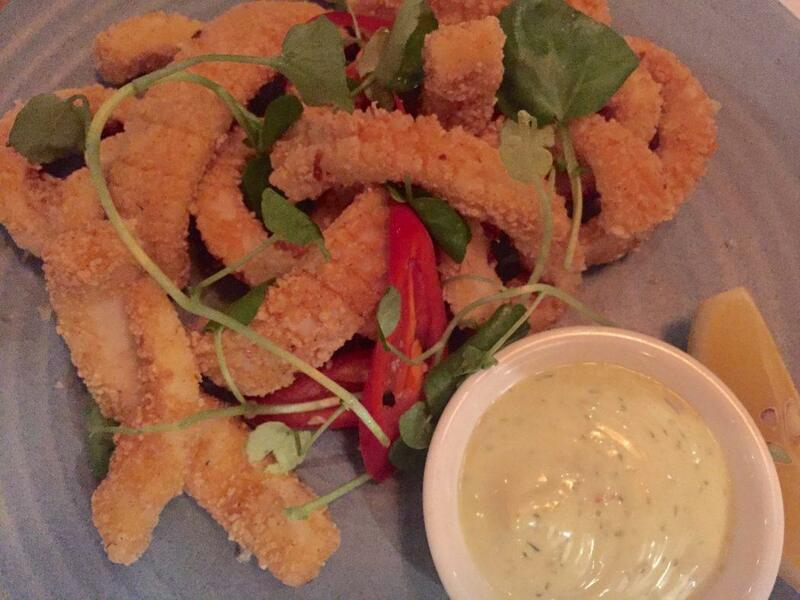 Next up was the calamari which was excellent – thick tender calamari with a very light coating. Then the highlight – the pumpkin! This was a very large portion of pumpkin that had been well baked topped with cheese and oregano and was an absolute sensation. I even ate all the skin it was so good! We also had the crab sliders which were a tasty option and a side of seasonal greens to make us feel healthier. For some more great food check out my post on the Best Mexican Restaurants in Melbourne. We were up bright and early the next morning as we had decided to drive down to the town of Sorrento and take the Queenscliff Sorrento ferry over to Queenscliff. 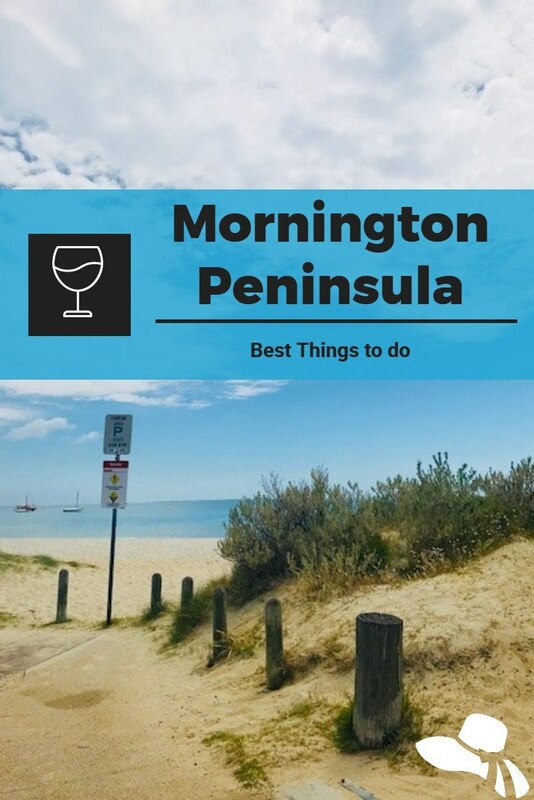 The mirror image of the Mornington Peninsula is the Bellarine Peninsula which also has several cute beachside towns well loved by Melbournians. The only way to get between the Peninsulas is by boat. The key way is the ferry between Sorrento and Queenscliff. The Queenscliff Sorrento ferry leaves on the hour each way and takes about 40 minutes per trip. You can take your car but it will cost another $100 and you probably don’t need it if you only plan on visiting Sorrento or Queenscliff only. The adult return ticket is only $22. It is a great ferry – very clean and modern. So many ferries I’ve been on in other countries have dirty windows and feel a million years old. The Queenscliff Sorrento ferry has sparkling clean windows and feels very fresh. There is a decent café on board and they even had decent coffee! The views heading in and out of each port are also great – would be fantastic to do this in the late afternoon light for photos. From the ferry port, it is about a 10-minute walk into the main town. 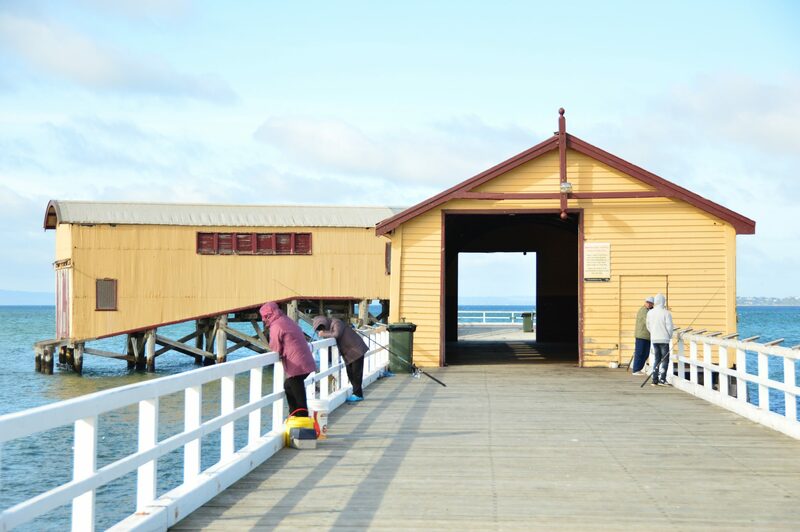 There are some touristy things on the way – the Queenscliff Pier which is quite photogenic (See attached shot!). You can walk to the top of the Observation Tower but we ran out of time for this. And there is a Maritime museum but that isn’t really my thing so we gave that a miss. Much more my thing is a wonder and finding good food! Queenscliff is a very cute old style heritage town. As you would expect there are therefore lots of cute food shops and loads of antique shops. We decided to visit Salt Bush for lunch. I do love a breakfast/lunch place that also sells beautifully packaged food products that I will most likely never use but really want to purchase. If you’re a fan of brunch read my post on the Best Melbourne Brunches. The breakfast menu looked good but we had moved into lunch time. They had two soups of the day and I went with the beef and barley with sourdough toast on the side. It was great – very hearty and flavoursome. I also had a side salad and boy the taste of that local lettuce! Normally I only eat rocket but this romaine was a sensation. And although the dessert options looked very tasty who can go past an old-fashioned lolly shop which was next door! We then wandered the street and had a peek in the Queenscliff Gallery which had some lovely prints. It was very soon time to head back to the ferry as we were determined to visit some of the Peninsula’s local wineries. Visiting Melbourne? 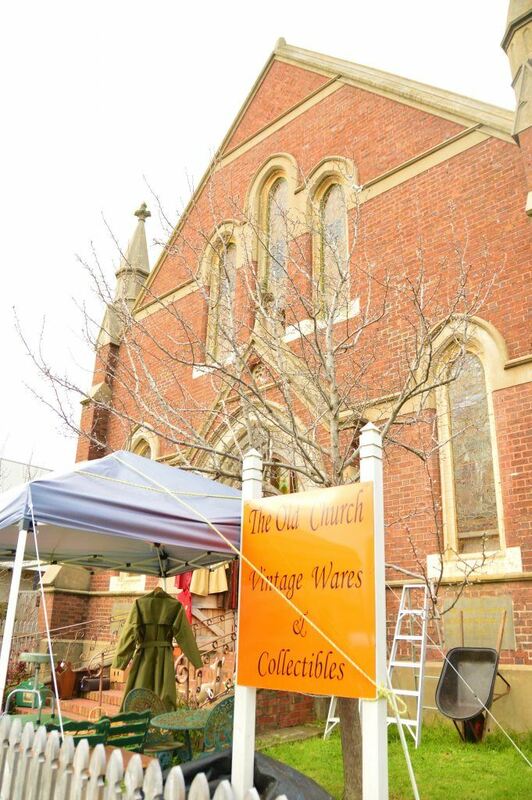 Don’t miss my post on Melbourne’s Hidden Gem Neighborhoods. The Sorrento main street is a bit of a buzzing shoppers paradise. It has everything from more mainstream Australian shops like Peter Alexander and Witchery to cute small labels and great beach and resort wear. There are also numerous cute cafes, restaurants and bakeries. This is the biggest shopping area on the Mornington Peninsula so if you need anything this is the place to go. A fantastic Sorrento restaurant is Italico. This is modern Italian eating at its best with fantastic wood-fired pizzas and brilliant pasta. 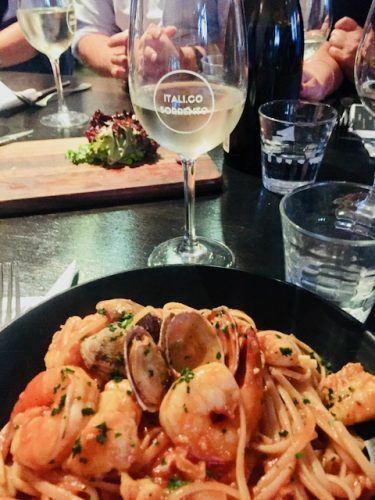 I had the seafood linguini and it was one of the best servings of pasta I think I have ever eaten – and overflowing with delicious seafood. There is also a great wine list and it is all very reasonably priced for the quality. The Sorrento Baths are a brand new set up on the Mornington Peninsula Freeway literally just before you arrive in Sorrento from Melbourne. They have only been open for a few months and have an a la carte restaurant and bar. They also hold functions. If you like being by the water and are heading to Sydney check out my post on Watsons Bay Sydney. Finally, if you are after a to die for taste sensation head to Just Fine Food Sorrento for a Vanilla slice. 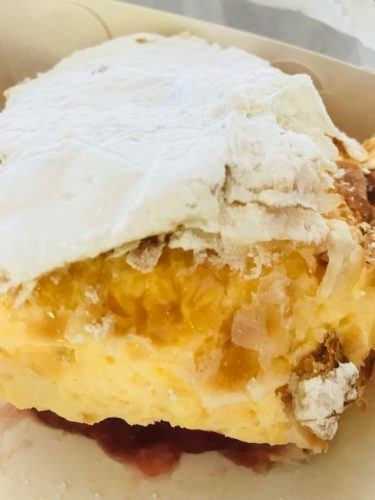 This is a classic Australian baker item that is essentially a big square of custard sandwiched between two light wafery pieces of dough with icing and icing sugar on top. However, Fine Foods takes this to a whole new level with the creamiest and most delicious custard you could ever have imagined. Quite rightly this is an award-winning vanilla slice and a must do for a Mornington Peninsula visit! Looking for another great weekend away from Melbourne? 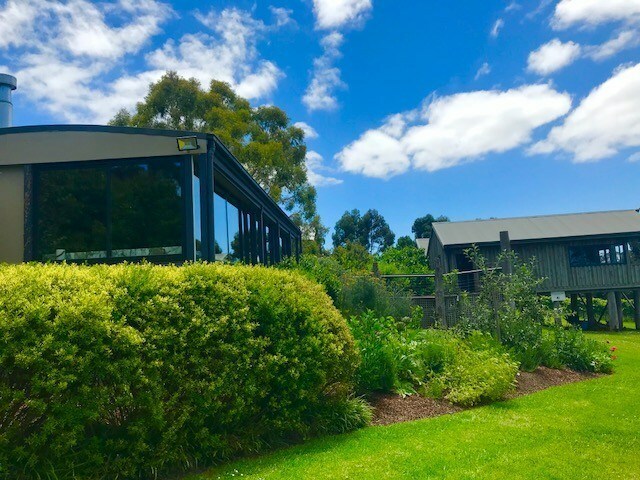 Check out my post on a Daylesford Spa Weekend. Most of the Mornington Peninsula wineries in the area are clustered around Dromana. 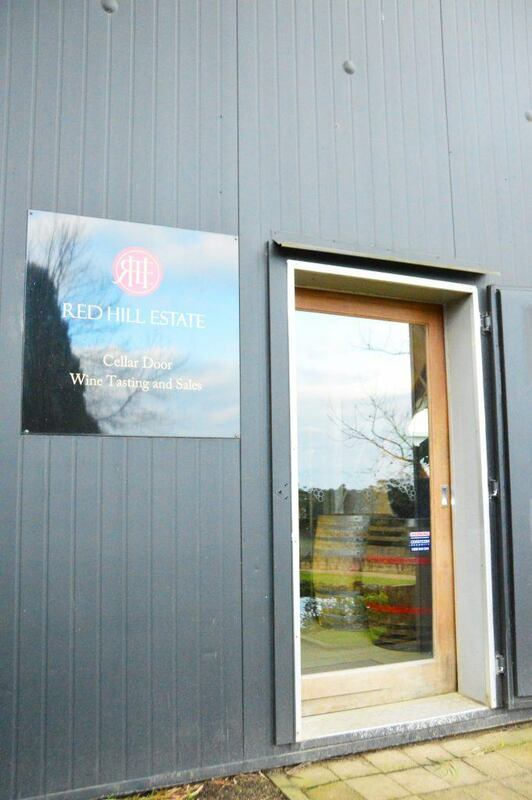 First up was Red Hill. Years ago I went to a hen’s lunch here and it was a lovely setting – and still is. We were just there for the cellar door though. I remembered it as being tiny and they have certainly expanded. We didn’t end up purchasing any wine although the Sauvignon Blanc was quite good and features on a few wine lists around town. Next up was Port Phillip Estate. This is a super modern building and not what you would expect from a winery. The key to its modern exterior is that the other side is glass floor to ceiling for stunning views of the vineyards. There is a restaurant and a bistro with loads of outdoor seating in addition to the cellar door. This area is known for its Pinot Noirs and I grabbed a couple of bottles of the Massale as well as a bottle of Chardonnay. 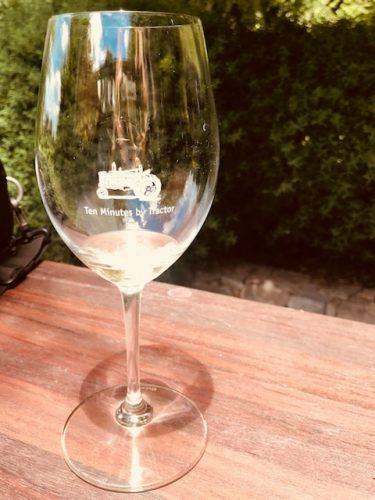 My absolute favourite winery in the region is the delightful Ten Minutes by Tractor. Ten minutes by Tractor is a wonderfully named winery that is inland on the peninsula and towards Flinders. It is such a lovely building with beautiful grounds and, of course, a few tractors! I actually went to the winery for a wedding and it was amazing! They are best known for their whites – chardonnay and sauvignon blanc – and their pinot noir. The Chardonnay is delicious but a bit on the pricey end. I was a big fan of the very reasonably priced Sauvignon Blanc. The food here was also absolutely fantastic. 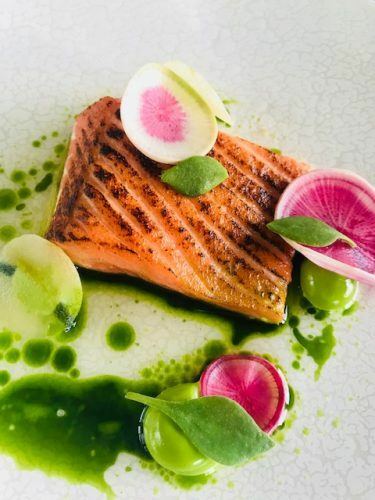 I kicked off with salmon in a miso broth which was delicious. The bread that was served with the meal was outstanding – so fresh and tasty. The main was a delicious piece of perfectly cooked beef with greens followed by an insane salted caramel and chocolate tart for dessert. This is a perfect spot for a lovely long lunch in the Mornington Peninsula. Vikki was keen for me to try Dee’s which is just off the main street in Dromana. It was a fantastic recommendation! Again this is warm and comfy brunch place filled with food products for purchase and prepared items for takeaway. As soon as I saw the potato and pumpkin rosemary hash with poached eggs there was no other breakfast choice for me! Substituting potato and pumpkin for my usual breakfast carbs of sourdough toast was a no brainer. It was a taste sensation – the pumpkin was just the right bit crispy and soft and was perfect with poached eggs. 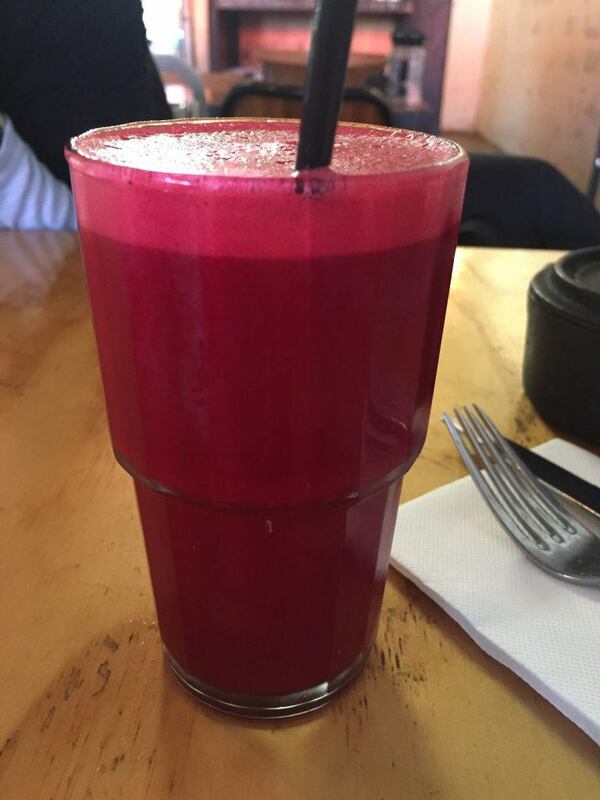 We also went healthy with apple, cucumber, mint and beetroot juice which tasted very healthy J. And good coffee of course. Looking for some more great meals? If you’re heading to Sydney don’t miss my post on its hottest new neighbourhoods and where to eat and drink – Barangaroo Restaurants. We then drove down to check out Portsea. There isn’t much in Portsea – all the action is in Sorrento in terms of shopping. But it does have the iconic Portsea pub which was a fantastic outdoor seating area and brilliant views. Heading to Sydney and limited for time? Check out my post on the 10 Must Do Sydney Experiences. If you aren’t lucky enough to have a friend with a house on the Mornington Peninsula you are going to need to look at hotels. 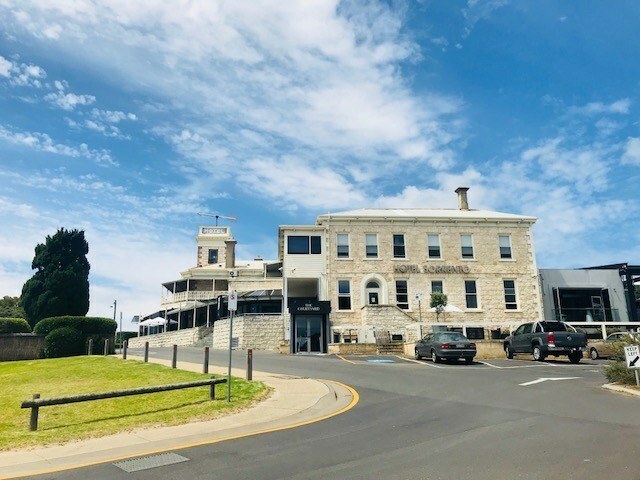 I recently visited and stayed at the Sorrento Hotel Victoria. This was a slightly unusual experience. This should be a fantastic hotel. The building is beautiful and it has an amazing location which is just moments from the beach and a great sprawling outdoor lawn. The rooms were lovely – boutique styling in keeping with the area, a good size, and Molton Brown toiletries. However, it was some of the patchiest services I have ever encountered. There was a huge mix of a surly front of house staff to incredibly friendly can’t do enough to help bar staff. I encountered quite a few staff members and you never knew which way it was going to go. We had heavy surliness checking in which I think put a bit of a dampener on things. The breakfast was also odd. I was quite excited about the aussie themed breakfast and it is AUD$30 for an outsider to come to breakfast at the hotel – which in Australia would guarantee you a great breakfast, coffee and smoothie at most breakfast places. However, breakfast was a very disappointing buffet. The bacon was good but the scrambled eggs were dry and the poached eggs cold and the sausages were cheap and plastic like. The fruit section was very disappointing – not much of it and most of it very bland and flavourless. There were standard cereals. It was possible to get a “proper” coffee eg a flat white but that cost extra which was fair enough. However, having ordered flat whites both mornings and the wait time was massive and the second morning I had to go upstairs and find the coffee myself and get it takeaway as it had taken so long. The breakfast is also held in a downstairs room which is like somewhere you would go for a work conference. There is very little outdoor space and it is quite dark. Here is a hotel located in the most stunning spot and they are serving breakfast downstairs in the dark? Very odd! Also, unless you are in for a party I would not stay at the Sorrento hotel Victoria on a Friday or a Saturday night. It is a lovely bar but the crowd can be quite rough. I stayed a Thursday and a Friday night and on Friday night we were warned about the locals by the bouncer before entering the bar. It is also very loud even though the bar officially closes at 11. It is a real shame as it is a lovely looking hotel but with the random extremes of service, poor breakfast experience and raucous locals it is hard for me to recommend it as a place to stay. –Lindenderry at Red Hill is the hotel at Red Hill Winery. This is a fantastic winery so of course, it has brilliant wine. This gorgeous boutique hotel has 40 rooms and they are beautifully decorated with a clean, minimalist look. Rates from £158 per night Click here for Prices and Availability. -This stunning hotel is only 12 months old. It features a very large statue of its namesake, the Jackalope, on the front lawn. The Jackalope is a giant horned jackrabbit of North American legend. The hotel features a yoga lawn and a 30m swimming pool plus two fabulous restaurants. Rates from £367 per night Click here for Prices and Availability. -For a special romantic occasion, you can’t go past Big Blue Backyard. This stunning property has only 3 rooms and each one features its own 2 person spa bath. Stunning giant beds and beautiful rooms. Rates from £500 per night. Click here for Prices and Availability. -A stunning B&B Arthur’s View boasts stunning views. It is based at the bottom of Arthur’s Seat thus affording the views. Only 4 suites available. Rates from £223 per night. Click here for Prices and Availability. -Flinders is located inland on the Mornington Peninsula. However, the Flinders Hotel is still close to both beaches and fantastic wineries. Rates start from a more affordable £113 per night. Click here for Prices and Availability. If you’re heading to Sydney check out my post on the 10 Best Weekend Getaways from Sydney for Boutique Hotel Lovers. We hopped in the car and decided to take a long way back. This involved a pit stop in Mornington. The main street in Mornington has come along way – it goes for quite some distance and is full of interesting shops and cafés. We hit the Gem Cottage Café for coffee. Once seated I then saw they had pumpkin soup on the menu so could not resist hitting the pumpkin trifecta! This was a tastier Thai style pumpkin soup with a little bit of heat and was the perfect ending to a lovely weekend in the Mornington Peninsula. If you’re looking for a somewhat more extensive trip from Melbourne how about really getting in touch with Australia and doing the epic drive between Melbourne and Perth? The nearest main airport for the Mornington Peninsula is Melbourne Airport. The best option for travelling from Melbourne to the Mornington Peninsula is to hire a car. The drive from the eastern suburbs in Melbourne is about one hour. The area is best explored by car. The other option is to take a bus the whole way or to take a train to Frankston and then take a bus. 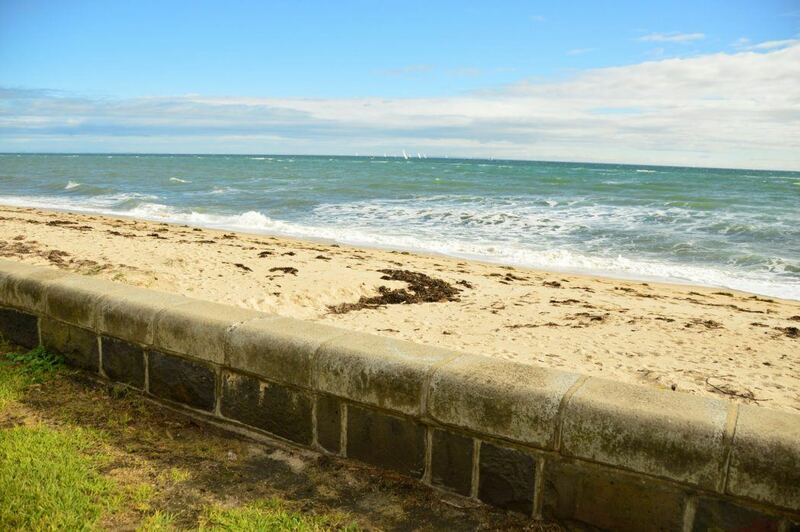 Check out all options for getting to the Mornington Peninsula here. Or several companies offer day trips to the Mornington Peninsula from Melbourne. Click here for a good deal on Travel Insurance. I love, love, love, love, love the Mornington Peninsular. Life goal is to own a beach hut on Brighton beach. This looks like a beautiful part of the country. I’m a sucker for anywhere with a beautiful coast. All of that food really made my mouth water! seems like you got the best weekend !!! Mornington Peninsula is such a fabulous place. Hope someday I could go there!! It feels so good to have such a beautiful getaway so close to home. I enjoyed reading the detailed account of your time in the mornington peninsula. But I wonder why the queenscliff’s main street looks so deserted. This is such a nice quick getaway and the food looks delicious. It seems nice to live near the area though. I was terribly distracted by the food because yeah I love food! That crab sliders is looking good. I’ve never met a person who loves pumpkin so it’s interesting to see someone who is into it. As with the area, I think I’d love to spend my mornings in a place that looks as peaceful as that. 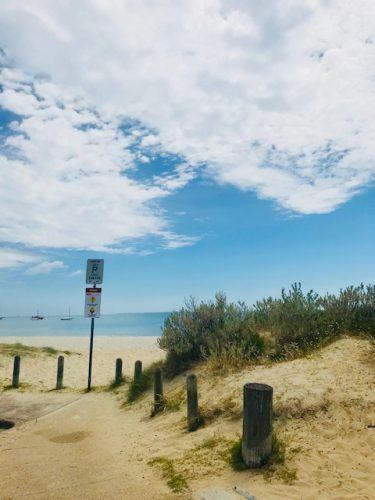 The Mornington Peninsula is one of my favourite places in Australia – sounds like you had the perfect weekend getaway with great food, drinks & company. I can’t wait to go back!